Recently and increasingly, literary and philosophical scholars are subscribing to the view that philosophy and literature are allies. However, nearly all of these scholars have concentrated on analyses of Greek philosophers and dramatists as well as English novels and novelists with reference to the nature of a good society and a moral life. The essays presented in A Community of Inquiry explore often-neglected works: classical American philosophy, especially pragmatism, and American literature, particularly the realists and naturalists, and mostly ignored fundamental issues of epistemology and metaphysics. This interdisciplinary study examines the connections between American philosophy and literature, demonstrating how a cluster of elements normally identified as the signature components of classical American philosophy are prominent in the canonical works of American literature. The subjects discussed range from Stephen Crane’s metaphysics to business ethics in William Dean Howells, pragmatic religion in Willa Cather and Harold Frederic, John Steinbeck’s philosophy of work, and Norman Maclean’s philosophy of community. Dooley is uniquely qualified to handle this study of the interactions and intersections of philosophical thinking and literary writing. 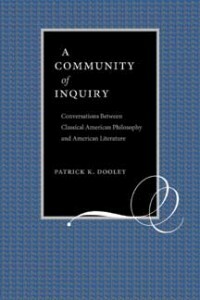 His philosophical background and analytical rigor provide a new perspective on the authors and subjects discussed in A Community of Inquiry, making this book appealing to those interested in American literary, intellectual, historical, and/or philosophical studies.